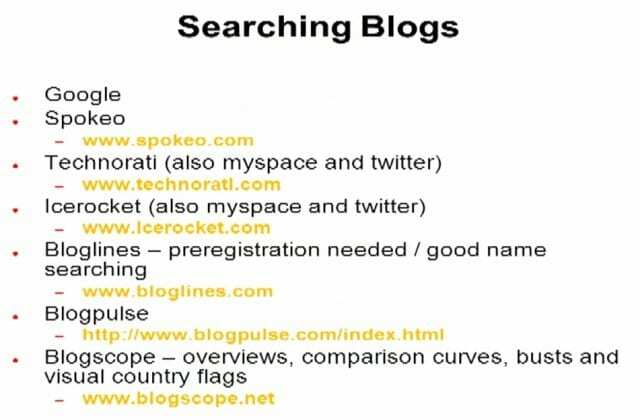 Lance’s primary focus in this part is blog searching services that might come in handy while conducting investigative research, as well as using Wiki-type sites to retrieve sensitive information. Searching blogs – we get to my favorite search engine of all. It’s not Google either. It’s the second one – Spokeo, the strongest one out there, I have been using it for years. I mean it’s the first place I turn to. Well, Technorati also does Myspace and Twitter. Icerocket – again, Myspace and Twitter. So I’ll actually go through Spokeo, Technorati, and Icerocket. And the last three – probably the only one out of those three I used is Bloglines, and it seemed pretty good to me with name searching. Now I will go through each of those individually. 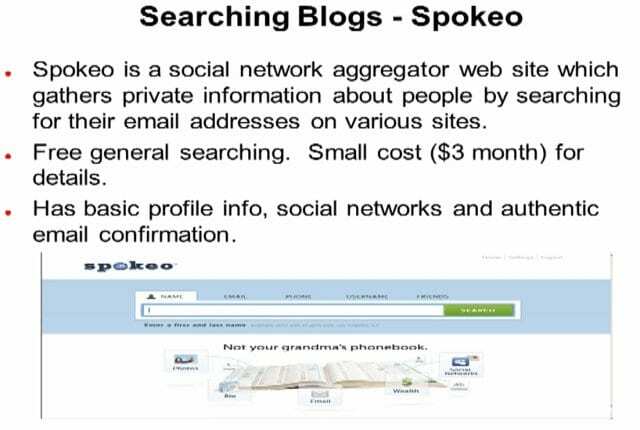 Spokeo is what’s called an aggregator website (see image). What does that mean? It basically combines a bunch of different functions into one thing. Say, I am searching for a name. If you do Lance Hawk, and you’re gonna come up with a ton of Lance Hawks, you’re gonna wanna refine it first. If I knew Lance Hawk was from Pennsylvania, I could do ‘Lance Hawk, PA’, and I’ll restrict the results just to PA. If I knew Lance Hawk was from a specific town in PA, then I could do it even further. But you don’t wanna get too restrictive, just in case you think Lance lives in one town, but what if he lives one town over? So usually you start a little higher and then fine tune yourself down. If you get returned, it’ll say, like: “I found 100 results” – well, 100 is actually is not bad, but I actually got ones that returned thousands of results, and you can be there all day. So the more information you have about whoever you are looking into upfront, the better off it’ll be. Now the bad part: it does free general searching, and you will see what it is in a minute. But there is a small cost for that. And this is 3 bucks. That’s about 3 bucks a month. But why I really like it is this: look at the social networks it goes through (see screenshot). Everybody always says: “Does that mean I can look at my son’s or daughter’s Myspace, or Facebook, or all this other stuff?” It all depends on how they have their settings. Basically, what will be indexed is the non-proprietary stuff, or something where they set a privacy option. And what I actually recommend to any parent, to anyone out here is – look yourself up, look yourself up with your name. Spokeo also has my user ID. And you can do stuff just by user IDs. Some of this stuff is amazing. I am finding more and more things on sites like Pandora and some of these other sites, also on Flickr, there is a lot of stuff. Some are very big sites, and this goes through them all. I like it. But again, trust but verify. And that gets technical enough, that gives you like the geolocation of a house, and you see a picture of the house. This will pop up the address right away, shows the house and the block. It will talk about the wealth status – like, within 100,000 USD to 120,000 USD. It’s amazing, the best one. 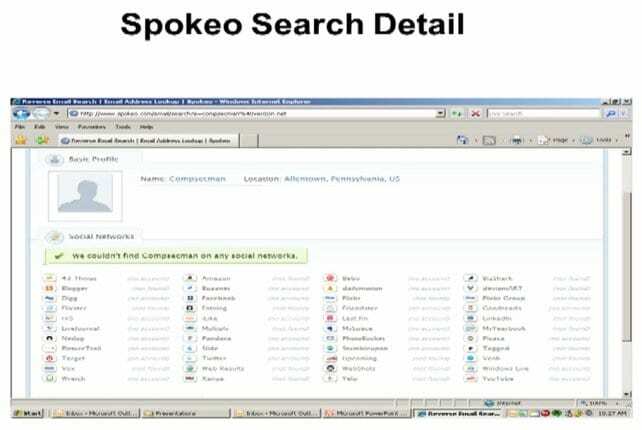 One thing, there have been a couple of court cases that places, especially like Spokeo, are giving out too much information. So everybody has to give an opt-out for somebody. So if you do not want to be included on something like Spokeo, basically if you go to Spokeo, under the disclaimer it says: “If you do not want to be included, click here and submit this”. It might be a good idea to do that. That’s good to do. And on a lot of these sites there’s been a lot of pressure. And one other thing, the one I won’t be talking much about today but I think presents a great example is LinkedIn. Previously, places like Google and stuff like that would include some LinkedIn content. But now what they’ve done, and I think they’ve set a bar, is they offer use three levels of searching that they now charge for, and they consider their content proprietary. So what’s normally indexed to search engines you cannot reach, and LinkedIn will charge you anywhere up to 50-60 dollars a month for the capability to search. Now they have a 20-30 dollar option, which is almost the same as the 60, there are some differences there though. Don’t forget something like LinkedIn and keep in mind that if you are searching certain sites, they start to get proprietary and do stuff like that. 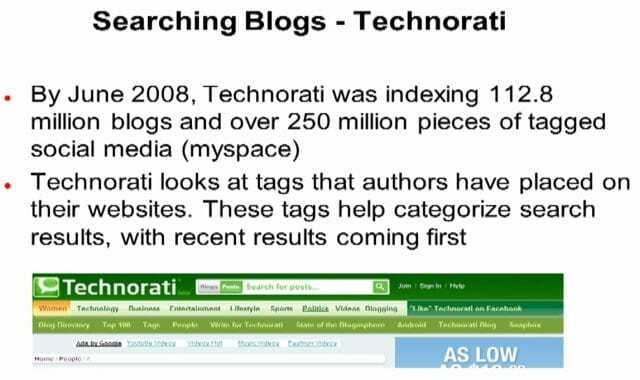 Okay, let’s now look into Technorati (see image). I tried to find updated numbers but they weren’t published. After I use Spokeo I basically go to this. Same type of deal: this actually looks at tags that authors placed on their websites. That’s exactly what it kinda looks like. What’s interesting is it will always show you like the top 100, and these different things that are going on. I use it more for the actual blog searching. And we talked about it earlier, I mean, why even worry about blogs, your stuff is not up there. It’s just the brief reviews we do, and we used to do them on annual basis, then it was semi-annual, then it was quarterly, now monthly. Well, we actually go out, and another thing you can do is put your own domain name in some of these places, and then use wildcards. See where your information is appearing, and I guarantee you will be shocked of what’s out there and what gets out there. We at ‘Air Products’ put in a social policy, but that doesn’t seem to be too successful. But I would hardly encourage everybody to do a periodic search on your own domain, just to see what’s out there. You’ll see stuff out there, I see confidential presentations being put out on some temporary website that was set up, and it has stuff we hold patents on. I guarantee you it’s probably on your domain too. So take your domain, put it through a couple of these – and you might be surprised. IceRocket – I like more because of the Twitter and Myspace stuff, same type of deal (see image). There was a government exercise I participated in, called ‘Cyber Storm’, I just wanted to see if it would pick up some stuff in ‘Cyber Storm’, which is a DHS exercise testing cyber readiness. I was surprised to see what people were talking about from around the world: from Germany, from quite a few other places. 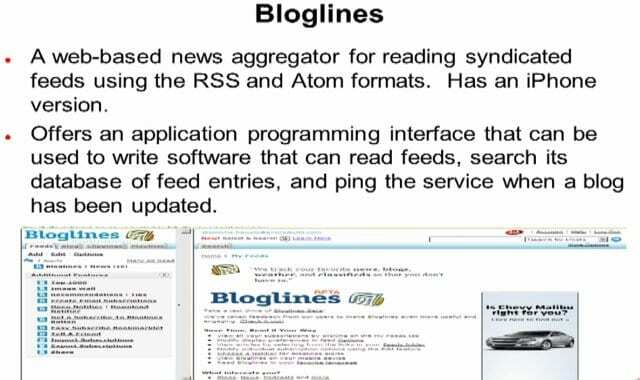 So, another good tool is Bloglines (see image), it does a lot of good stuff with names. BlogPulse – this starts getting into a lot of the graphic stuff. We are going to talk about how graphical some of these places are going. In fact, now they are coming with what’s called ‘visualizers’, which is a new technology. There is a Facebook visualizer, which is one only available to law enforcement, but that’s supposed be open to the public quite soon. And you can actually look and see, like, here is Lance Hawk, here is Lance Hawk’s friend. It does a visualization profile. ‘NCIS: Los Angeles’1 – I don’t know if anybody watches that, but you see where they are grabbing the stuff and bringing it down. It’s the same type of concept. 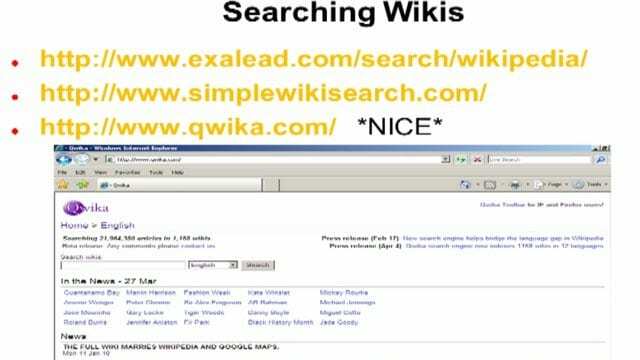 Okay now, searching Wikis – probably the nicest one I like is Qwika when it comes to that. It doesn’t seem to get as much of the press as the others, but I like that a lot more. It is much more simple, it seems to return more. Again, it’s just very simple, just like with a blog, it’s like with Google. Say, I am searching for ‘Surfynol 104’ – that product I talked about. I search the Wikis, and we were shocked at some of the information we found. You know, people are escaping from blogs and maybe going to Wikis, or vice versa. It would be nice if I could give you the super search engine, where you just go to one place, but that does not exist. Especially see what LinkedIn is doing and how they are carving out space. And that’s probably gonna continue, which means there are going to be more and more specialized searching and search engines. 1 – NCIS: Los Angeles (Naval Criminal Investigative Service: Los Angeles) is an American television series combining elements of the military drama and police procedural genres.